Jan 20, 2016 50 Floor would like to thank you for taking the time to submit a review. 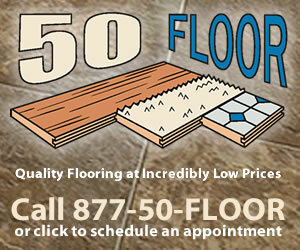 We also appreciate you choosing to contract with our company for your flooring needs. I personally wish to assist you with your flooring matters you have described in your review. Unfortunately you have not provided enough information to effectively assist you further. Please feel free to give me a call directly to address your floor concerns. The same as most of the customers who are complaining. Buckling of the floor in less than one week after instalation. They failed to install 2 closets, the installer was a *** who felt it was my duty to move the furniture, which my daughter and i did move a lot. He refused to start until i finally had to call the office. I wish i had never heard of 50-floor. I finally had to take them to court, the judge awarded me the judgement, which has never been paid. They called me dishonest, apparently felt the judge was dishonest, and because i did not call them personally to tell them i had filed a claim. I had to serve them 3 times to three 3 different locations before getting them served. I was not supposed to notify them, the papers that served them told them of the claim. The general manager was the last of the 4 people who inspected the damaged materials. Had the floor not buckled it still would have been inferior materials. When i clean the floors i spend about 3 hours cleaning them, of course i have to vacuum, i mop, i use a dust mop. I should be able to clean with a dust mop, with a damp mop only one time a month. I followed the advice of justin who is the installation manager on how to clean. I am 74 years old and i have arthritis. At that time i noticed swelling in my abdomen, learning it was a hernia having surgery for that problem. I am not saying the cleaning methods caused it but i think it exacerbated the growth of it. I would never have gone to the media had they done what they should have. I know now that they overcharged me. The laminate is very thin, and after checking with Home Depot and what they had that was less than 50-floor charged. There was a great difference in the quality of their laminate compared to 50-floor's materials. I only want them to do the right thing and i can get over the situation. Review #770857 is a subjective opinion of tommiev2.